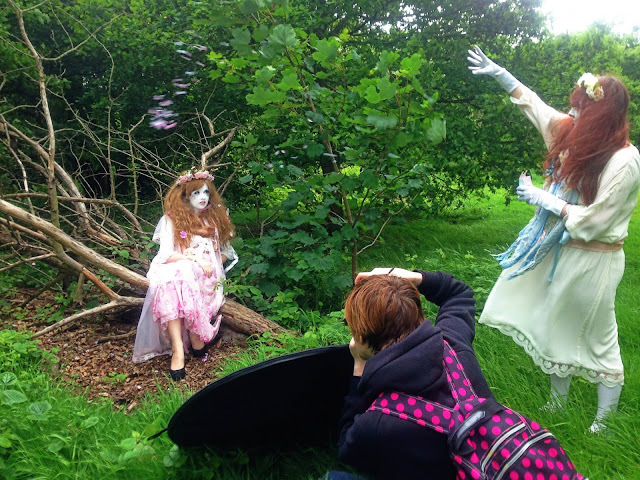 Capsule Bunny: Behind the scenes of the Shironuri shoot for MyM magazine! Behind the scenes of the Shironuri shoot for MyM magazine! 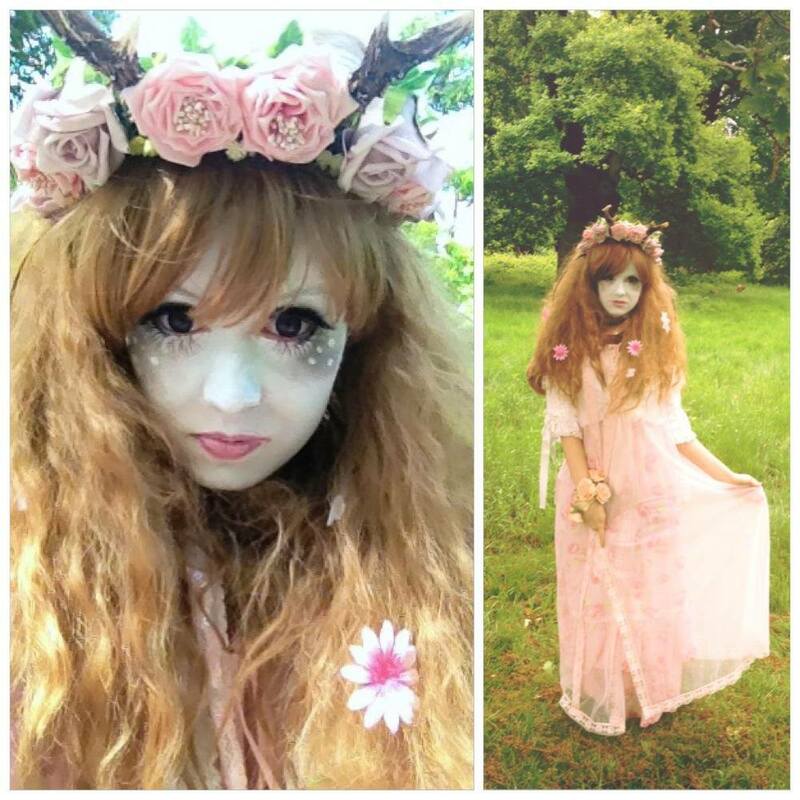 Now I have been doing shironuri for quite awhile I have started experimenting more with styles and makeup, the shoot with MyM magazine was perfect as we were shooting in Epping forest. The verdant greenery was a lovely setting for the fashion - I got to pose atop moss covered logs, in between thickets and in overgrown grass covered in rabbit poop. The look itself I wanted to emanate spring, with lots of pink blossoms and flowing layers and a fawn theme. The gorgeous headpiece was made by Hysteria Machine, they make gorgeous head wear of all kinds and she was kind enough to lend it to me, but in the end I loved it so much I ended up buying it! I tried creating fawn print on my face with eye shadow and more shironuri as speckles, it actually came out better than I had expected! I only hope it comes out well on camera. 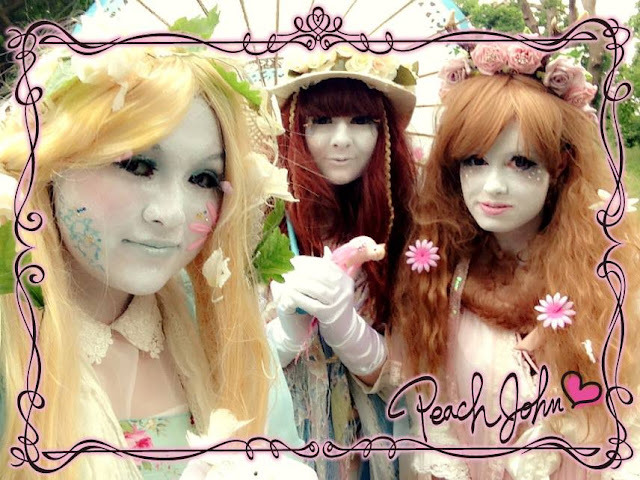 I was lucky enough to model with the gorgeous Mary-Ann and Grace St.John, they both pulled off shironuri beautifully and did their own makeup! Grace wore a very classic blue themed outfit, while Mary-Ann opted for minty green, with blonde hair entwined with ivy. Our outfits were all different, yet seem to match so well! I think this was a perfect coincidence. Grace was also kind enough to buy petals , it was hilarious trying to pose whilst watching people frantically throw petals into the shot >__< They were actually made from real petals and I can only hope came out in the shots! You can see them here on my camera phone as a manic blur. The magazine should be out at the start of next month, I will no doubt post the pictures here when it has been published, I'm really excited!